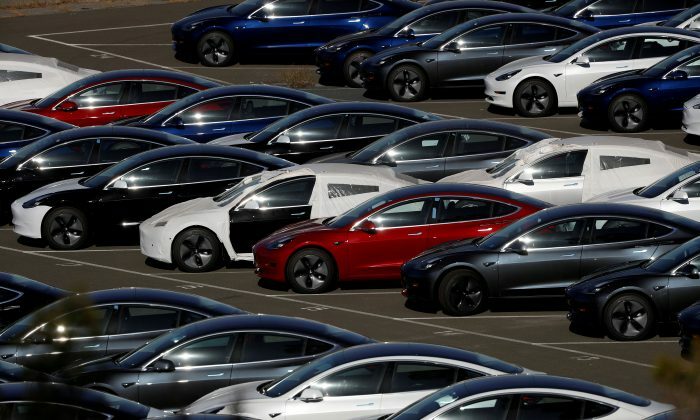 Tesla Inc. said on Feb. 6 it was lowering the price of its Model 3 sedan for the second time this year, moves that come in the wake of Tesla losing a tax credit that made its cars more affordable for U.S. buyers. A U.S. federal tax credit began phasing out for Tesla in January, effectively raising the price of cars by $3,750. Tesla said on Feb. 5 it had cut the Model 3 price by $1,100, following a cut of as much as $2,000 in January. Musk told a Twitter user that the company is “doing everything we can” to drop the Model 3 base price to $35,000, without credits. “It’s a super hard grind,” he wrote. The billionaire in the past few months has been pushing for cost-cutting initiatives, like cutting jobs and ending a customer referral program. Tesla said in a statement that ending the costly referral program allowed it to cut the Model 3 price. Tesla delivered fewer-than-expected Model 3 sedans in the fourth quarter. The Palo Alto, California-based company’s share were down 0.45 percent at $319.89 in premarket trading on Feb. 6.